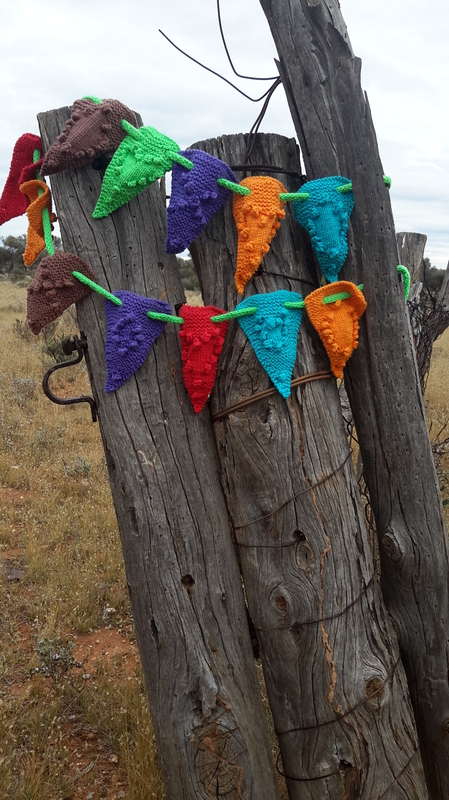 Bush Bunting – Craft-a-licious . .
Bunting definition: small flags strung together, often gaily coloured, generally used as a decorative accessory to a celebratory occasion. I’m currently traveling around the West Australian outback and wondered how I could photograph the magnificent landscape to include some crafty aspect. 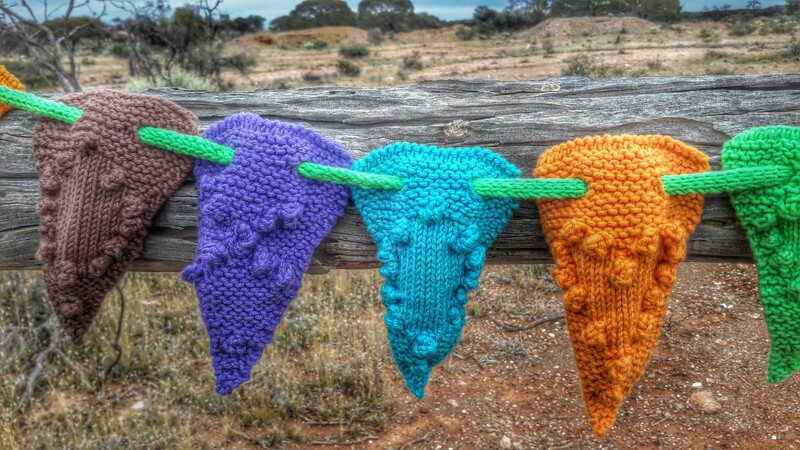 Then I recalled my very first post on this blog about the guerilla knitting I happily chanced upon in Melbourne, and thought why not create a bit of Bush Bunting to hang in the arid countryside. 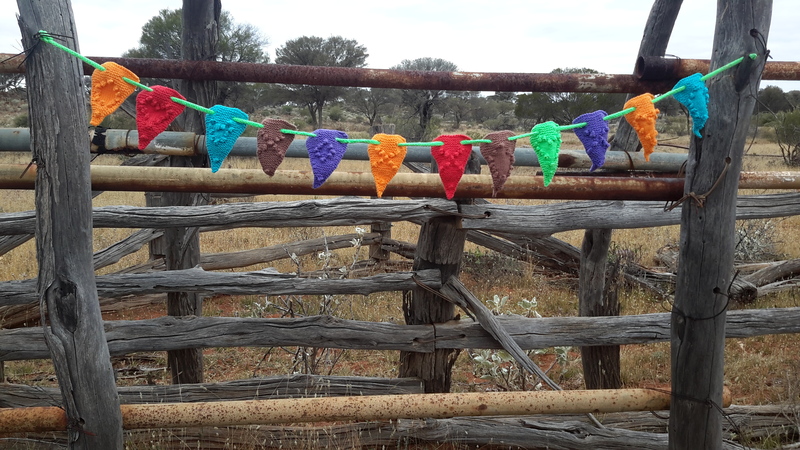 So I did, embossing each gaily coloured pennant with a kiss, a cuddle or a heart, so there was a bit of loving flapping in the outback breeze. 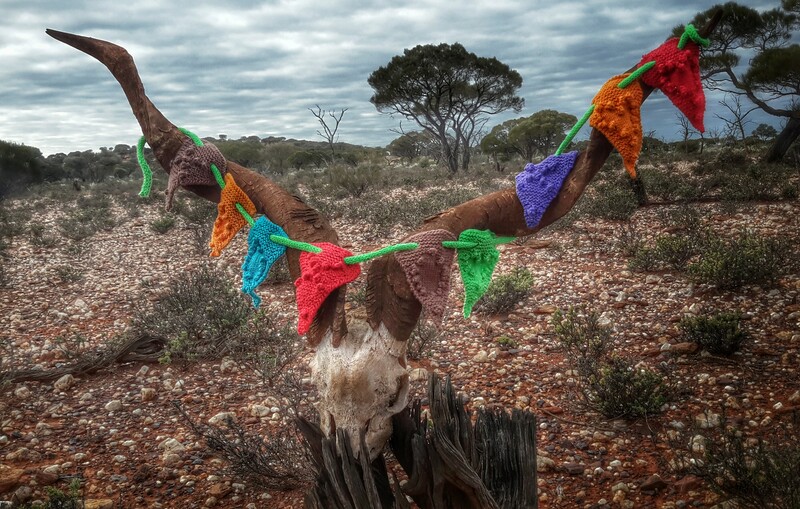 Magnificent feral goat skull – bunted! Old fence posts – bunted up! Another place very well deserving of bunting – though (sadly) I’ve never seen it – is on prams. The biggest celebration I can think of is the birth of a child. Therefore it makes perfect sense to put bunting all over a pram – sending a happy message to the community at large upon them seeing the extravagantly decorated baby transport. So dear readers, for the sake of all those babies who should be celebrated with pennants flying from their little carriages as they are proudly strolled along streets by their parents/grandparents/aunties etc. please knit some bunting for them! It’s no penance to knit a pennant! Cath’s Bush Bunting, created exclusively for babies on the move, harking from the stunning West Australian gold fields … ta daaah!! I shall post the Bush Bunting patterns on Ravelry.com when I work out how ..
Hi Glenda, thanks kindly for your lovely comment! Hi Trish – thanks so kindly for testing my patterns, a testing experience in more ways than one! I enjoyed your pics and comments. They were really helpful! Photos came up really well Cathy. Well done on the bunting! Thanks Helen – am quite chuffed with the results of both pics and knitting! Sublime Cathy!!!! Both the craft and the scenery. Thank you Mrs Beer! How did the birthday guests enjoy your bunches of beautiful origami tulips?? Still think that was a truly magnificent idea!! Jules you are an almost retired legend! … yep, i’ve been thinken about what I can decorate the Opera House with – guerilla knitten-wise..! You are a marvel Cathy, I love the colours and the idea is equally fantastic. Great to see that you can still create after your injury , the photography’s not so shabby too! An interesting idea cath -I’ve never seen knitted bunting before anywhere. It looks like you’ve put a LOT of hard work on the design front into this, with the lil heart patterns etc. Is the connector “string” french knitting? Hahah you’ve Bunted Up the Outback! Hope you kept that goat skull with magnifique horns coz it’s worth 300 or 400 bucks on the collectors market! Hi Deb, glad you liked the Bush that’s been bunted up! Just a little treat for my own pleasure as the landscape colours (except sunsets) are not at all vivid. Excellent spotting with the ‘string’ Deb. Yes, it is almost identical to french knitting – well done!! Are skulls really worth that much?! Man, there’s a fortune going begging on the ground out here then! Hi Cathy, Love the bunting and also think it would look great in baby prams. I may give it a go. I’m knitting headbands atm. Good old blackberry stich. I will SMS you a pic. Glad your hand is recovering. CHEERS. I wonder if those blackberried headbands are using the colour pallette of red and black??!! No doubt!! Looking forward to seeing the pic! Thanks Sandy! There’s not much you can do out here other than knit and gold prospect. Knitting is far and away more satisfying than digging holes in the rock hard earth in really hot temps!